Introduction: This is the last essay in this series, an attempt on my part to set out what I think about the ‘climate change’ issue. It is based on the fifteen previous essays in the series, each linked in the text with (#x), which are in turn based on ten years of reading and thinking about the matter, plus half a working lifetime in the research policy and funding domain. I do not claim to be right about all of this, or indeed of any of it. ‘Climate change’ is an incredibly complicated business, involving the areas of study of the natural and social sciences, the humanities, politics, government, religion and much else. It is important, but not as important as its adherents think it is. In the end we will learn much more, and be able to place the current issue in its proper perspective. The notion that we have all the information that we need to make good policy in an area as multi-faceted as this is fatuous in the extreme. The series is intended for this who would like a short-cut to knowledge. Like all short-cuts, this one has its pitfalls. Bob Carter, an eminent scientist himself, said that to understand what this is all about requires years of reading. I am in my eleventh year of that reading, and there is a great deal I don’t know well, or at all. Nonetheless, one doesn’t have to know it all to be able to come to terms with what a former Australian Prime Minister, Kevin Rudd, described (inaccurately, in my opinion) as ‘the greatest moral, economic and social challenge of our time’. We are all citizens, with the right to vote and the need to know what we are voting about. This series is offered as an aid to people who would like to find to more. The basis for my judgments and analysis consists of the articles and other analyses I have read. You will find them by going back to what I wrote on this website and seeing what the sources were. The easiest way is to type in what you are interested in — perhaps ‘rising sea levels’ — at the magnifying glass icon on the top right of the website home page. Global warming, as such, seems to have been so far a good thing. The Earth’s atmosphere seems to have warmed about one degree Celsius over the past century and a half, which has contributed to greater food production to support a much larger human population. It seems to me very likely that human activities of various kinds, burning fossil fuels, making cement, clearing forest for agriculture, and so on, have caused at least some of that warming, a process that has been called ‘anthropogenic global warming’, AGW for short. There must have been other causes as well, because although greenhouse gas emissions have risen steadily, especially since the middle of the 20th century, measured atmospheric temperature seems to fluctuate quite widely. We have no great knowledge about what the other factors in warming and cooling are, or their interactions, but we are learning. The global warming scare, or Catastrophic Global Warming (CAGW) is another thing altogether. It can be dated from 1988, when Dr James Hansen, then Director of the Goddard Institute for Space Studies, an NASA agency, warned a US Senate panel that global warming had arrived, and was caused by greenhouse gases; it was really serious. He and other scientists at the time spoke of a future of melting ice, rising sea levels, droughts, and loss of forests. The accompanying call was to abandon the use of fossil fuels. There had been a cooling scare in the 1970s, too, but the warming one of 1988 developed an astonishing momentum (#2) both internationally and within the Western democracies. Global warming, later ‘climate change’, became and has remained an important political issue. It is now close to thirty years since Dr Hansen delivered his address, and some of the heat has gone out of the issue. In Australia it is an issue of passion for perhaps seven per cent of Australians, a figure that sits comfortably within the Green share of the vote at Australian elections. CAGW bridges the space between science and politics in an almost unprecedented way, though it has some similarities to the ‘eugenics’ issue a hundred years ago. The difference today is that governments are involved, not because the science says they must be, but because the electorate thinks that there is a single ‘science’ that points in the direction of ‘renewable energy’ and the abandonment of fossil fuels, a belief that is fostered by many scientific organisations, NGOs and the mass media, for which doom-laden stories are good front-page material. In fact, despite Al Gore, the science of global warming is not at all settled, and over nearly three decades the core CAGW proposition (#3) — that current warming is unprecedented, and catastrophes of all kinds will be visited on humanity unless it abandons fossil fuels, NOW — has become less and less plausible. The Earth is warmer than it was 150 years ago, but it may have been appreciably warmer during the Middle Ages, the Roman period and the Minoan period, when greenhouse gases, so far as we know, were not as concentrated as they now are (#4). We still don’t know how much of the present warming has been caused by human activity, and no paper has been published that shows the link decisively, even after thirty years and the expenditure of billions of dollars on climate research and computer model-building (#5). The seas are rising, but that has been true for some hundreds of years, and the rise may have more to do with the end of the last glacial period than with the modern increase in greenhouse gases. It is not at all clear that there is any acceleration of that rise (#6), and tidal gauges in geologically stable areas, like Sydney harbour, show both a tiny increase over a century and more, together with a lack of acceleration. Coral islands are growing, not disappearing, and there are no climate refugees, though 50 million were prophesied for 2010 several years earlier. As with so much more of climate science, we lack really good long-term observational evidence — the middle of the 19th century is really the beginning of carefully collected weather data. This gap has been filled in part, a small part, by proxies of various kinds, data about something else from one which one might be able to infer temperature, or rainfall, or fire. There are problems with all these proxies. For the future, one can either extrapolate from the present and past, which is what Dr Hansen did in 1988, and/or build climate models, based on known physics and chemistry, plus what observations we do have, plus some estimates of what might happen economically and industrially in the future. Computer models are not new, but they are now large and complicated. Unfortunately for the modellers, the Earth is a large place, and for models to be accurate they need to have data from thousands of particular places, and many times a day. This is not yet possible, and it may not be possible at all to derive useful knowledge from the models anyway, because of the chaotic nature of weather. Moreover, the large climate models, General (or Global) Circulation Models (GCMs), have neither been validated or verified, and their success in predicting what will happen has so far been poor (#7). A 16-year long pause, or hiatus, in global warming, from about 2000 to the elNino if last year and early this year, was not predicted at all by the models. What is to be done? And why do so many still believe in the foretold doom? The answer to the first question is that governments seem to be doing their best to get out of policies and regulations that aimed to shift us all to renewable energy, though they are slow to do it. There are two reasons. First, the doomsters are now talking about a time that seems a long way away, long past anyone’s lifetime, let alone the life of elected governments. The second is that cheap, reliable energy is the basis of the Western way of life, and there is no possible transition to renewable energy that is not extremely expensive for everyone. Why do people believe in it all? There is no simple answer (#8). But elements of an explanation will include the arrival of environmentalism as a kind of substitute for organised Christianity, the growing wealth of the Western nations, a change in the nature of party systems, a feeling of guilt both that humanity may have done something bad, and that we are rich and other people are poor. In addition, the great majority of Western people now have no real connection either to agriculture or to industry, let alone to mining, in their daily lives. They do not see proposed policies as having anything to do with themselves, only to others. In fact, the notion that we already have the capacity to replace fossil fuels with solar and wind power is fanciful and wrong-headed, for all sorts of quite simple reasons (#9), and in time I expect these policies to be wound back, as is already happening overseas. The process will not happen quickly unless there is a sudden and ‘alarming’ cooling period. Politicians have convinced themselves that ’97 per cent of climate scientists’ think that humans are responsible for dangerous global warming, which is quite wrong (#10), and scientific organisations, which see the AGW as a main source of funding for science of all kinds, keep on advising governments that ‘climate change’ is a central issue (#11). The AGW scare has been one of the causes of what many see as a decline in the real power and status of scientific research, though there are others. The level of argument and debate about the issue, at least in politics and the mainstream media, is simply abysmal (#13). No one seems able to distinguish between ‘weather’ and ‘climate’ (#12). Conventionally, ‘climate’ is the average of thirty years of weather, which seems much too small a difference, at least to me, to be of any explanatory or practical use, given that the changes in climate we know of from history seem to be of the order of a couple of centuries or more. In 2016 the peak of public and governmental interest in ‘climate change’ is long past. There is now an increasing volume of climate science that is not based on the assumption that carbon dioxide is the villain, while the Paris Agreement of late 2015, signed by most nations in April this year, is devoid of real commitments to do anything except to meet again. Within the scientific community itself there is a kind of stasis, in which, at least in my judgment, there is a agreement that we need to know a lot more about the other variables that act on climate (#14). The much heralded ‘precautionary principle’ of 1992 (#15) is now being seen, as it should have been from the beginning, as operating in both directions: if we do not known nearly as much as we should about something, it is mistake to spend a great deal of money in any attempt to deal with it. Find out first, ought to be the rule. I do not expect anything of great consequence to happen in this domain. Unless there is a sudden shift to cooling, or another long burst of warming (neither of them likely to be associated with carbon dioxide), my expectation is that by 2020 the world will have other issues to deal with, and ‘global warming’ and ‘climate change’ will be seen as rather aberrant fusses of the past. Some of those who made the greatest fuss about it will be very quiet about their role. End-note: I have in mind publishing the series as a small ebook, perhaps by year’s end. A good summary Don and your proposed small ebook is a very good idea! This is entirely convincing and in the true spirit of scholarly inquiry. I’d love to see this published in a newspaper, ‘The Australian’ for preference. A book? Certainly, but there are so many books. An article might have an immediate impact and be a good advertisement for the fuller treatment to come. Nice summary Don. A few thoughts if I may. My experience with the Climate Church faithful leads me to the following conclusions. (1) there is a widespread assumption that the UN’s IPCC comprises impartial, objective & unbiased experts on ‘climate science’. IF that assumption reflected reality then it may be reasonable to trust the IPCC. Unfortunately that key assumption is quite false. Firstly, it is clear that from its inception IPCC was commissioned by the UN to implicate anthropogenic carbon dioxide as the culprit. Most of the public, the media and politicians have little or no understanding of the scientific method and that has allowed the political agenda to go virtually unchallenged (at the political level at least). Any dissent is met with name calling, castigation and ‘shut up’. From my perspective the key part of the scientific method is that if a theory makes predictions which are not matched by subsequent observations then the theory is wrong. South Australia is now experiencing a crisis of power supply because of its implementation of green policy, closing down coal fired power stations & installing windmills. SA also has the highest priced electricity and is now pleading for power from other states. I expect that this fact will lead to more rigorous discussion of ‘climate change’ especially in the Senate now that Malcolm Roberts will have a platform there. I forgot to mention poor handling of uncertainty (when discussing the IAC Review). I think it’s worth observing that climate change scratches a lot of backs. Apart from scientists and environmentalists there’s financiers interested in certificates of hot air, politicians trying to control people and charitable organisations seeing as a vehicle for wealth distribution. •	Germany will replace most subsidies for local green energy with “competitive auctions where the cheapest electricity wins”. Currently the costs in Germany are US$0.39 per kWh, while in the US the cost is $0.104. •	Germany will remove 6000 mWh of wind power by 2019 (I assume that is plated capacity). •	European green energy subsidies: 2011 – $132b; 2015 $58b (I assume the figures are in USD). In the USA, regardless of what one might think of Donald Trump and many of his statements, a major reason for his success to date in the Republican race, has been his plain speaking on issues that bite at the grass roots level. So here we have a sufficiently disturbed section of the population who have registered as members of that Party, who have rejected the conventional wisdom offered by its leaders. In the vote on Brexit, we see a similar rejection of the perceived wisdom of the leaders. It is interesting that the new cabinet under Theresa May is markedly different to that of David Cameron’s – far less privileged, and I suspect as a result, far more in touch with the ordinary world of competing ideas, the challenges of making a living, and of simply asking “why?”. The cabinet evidently includes a number of “climate sceptics”, some of whom have in previous years made some strong statements about the costs and supposed benefits of wind and solar renewable energy policies. The retreat from the madness of CAGW will indeed not be heralded by apologies; as you say, those most strident in their support for AGW or CAGW will be very quiet about their roles – “scientists”, politicians and journalists alike. But as you suggest, policies will be changed without a lot of fanfare. But the retreat will be faster, because once the muttering spreads that the Emperor indeed hath no clothes, there will be many villagers at the back of the crowds who will shake their heads and genuinely say to themselves, “well, I had my doubts for a long time”. And they’ll never trust a tailor again. Concern for AGW predates Dr Hanson’s speech of 1988. And I know this because I learnt about all about climate change in my high-school geography course, which I completed at Philip College, Canberra in 1979. Mr Irwin was my Geography teacher and a pretty good teacher at that! He taught us about man made CO2 emissions, clouds, water vapor and the dynamics of the green house effect and the impending rise in global temperature. I no longer have my class notes, but I do remember asking Mr Irwin what was going to happen? He did said he did not know. I remember the response struck me as interesting because teachers were always supposed to have the answer. I reckon what we were taught about AGW over 35 years ago in high-school geography at Philip College, looks pretty spot on to me. While not disputing your memory about what you learned in 1979, what I said was the AGW scare could be dated from 1988. Of course there was ‘concern’ about the possibility of runaway greenhouse gas emissions and temperature on the part of some before that year. Since your teacher didn’t know what would happen, and the rise in temperature after 1998 has been pretty small compared to the 1980s, what exactly was spot on? My first awareness of possible alarm about our planet’s future was the hole in the ozone layer. This was in the mid eighties. I’ve read it is closing, but why did it disappear from the news and, is it/was it then, part of the global warming issue? Yes, there are interesting parallels, which I’ll come to shortly. The assumed major problem as I understand was the emission of CFCs (chlorofluorocarbons) used in appliances as refrigerants, and in spray cans to provide pressure. (There are additional gas emissions that were of concern.) At the time (the Montreal Protocol came into force in 1989) it seemed a good idea to me, but I have found more recently that there is considerable discussion about what causes the ozone layer to vary over time. We have really been measuring it only in more recent decades, so we have little to go on, I understand. We do know that cosmic rays can be quite damaging to ozone, a molecule that consists of three Oxygen atoms, knocking an atom off randomly. We also know that ozone is important in protecting the earth’s surface from a lot of damaging ultra-violet light. But it does not appear that the quite effective reduction in those emissions has led directly to much change in the ozone layer; we have certainly not had such a result trumpeted as conclusive evidence of sound science and international cooperation in altering the composition of the atmosphere. The reason the Protocol was accepted and implemented readily, was that we had economic substitutes available, so there was little to argue about. Its acceptance is proclaimed as an example of international cooperation, but any effective results are not so trumpeted, mainly because we can’t be sure, I believe, that we have any conclusive results. So I see these parallels between the ozone issue and the carbon dioxide issue: each arose out of apparent concern that humans were creating a problem, and could therefore fix it with suitable action; each theory was based on known behaviour in a laboratory environment; action on each was promoted strongly at the political level. You’re right, it has disappeared from the news, despite the size of that ozone hole wavering around in the upper atmosphere. Convinced we have solved the problem, we are less interested to see whether our actions have had anything to do with it at all. I’m very happy to be corrected on any of the above, and to learn more. Unfortunately, the HFCs that replaced the CFCs in order to save the ozone layer, turn out to be extremely potent greenhouse gasses, way way worse than CO2. As they start to leak out of all the post -1996 fridges, air-conditioners, car air-conditioners etc. they’re becoming a significant AGW issue (well, only if you believe greenhouse gasses make the planet warmer and that a warmer planet is not a good thing). I’ve read something like this somewhere, Jimbo. Do you have a good link? There was some useful discussion in the Comments. I still don’t know whether the ban on CFCs had a decisive effect, though as a skin-cancer sufferer I was in favour of it at the time. Would your good Geography teacher Mr irwin have a different understanding about how climate operates today? I would hope he would, given the further information and actual observations we now have. I would also think it likely, given those early discussions of the science, he was aware and forward thinking back in 1979. His response to you is interesting, that he did not know then what would happen. It is also perhaps relevant that less than ten years earlier, some scientists had been predicting we were about to enter a very cold period (we had measured a cooling from the 1940s to that time, as I’m sure you know). So by 1979, as far as I can recall, there was little discussed in the public arena about global warming and “greenhouse effects”. By 1989, a good Geography teacher would probably accept what was being said then about the climate, and answer that we did face a continuing warming. But good teachers and good scientists will keep enquiring, and if the evidence contradicts previously held judgements , they are prepared to change their conclusions, and state their reasons. Thanks, Spangled – I’m amazed at how much was out there! I know in those years I was furiously trying to make my way in a career, so an awful lot passed me by. As it does for our grown childrent today: they’re just darned busy. It throws much onus on the media to be reliable, an expectation sadly disappointed. The “World” was not doing anything of the sort. Spang if you go to Google scholar and search on the exact phrase “Global cooling” in articles published pre 1975 you will get 114 articles. If you do the same search using “Global warming” you get 1170 articles. Now I understand what the weight of evidence means: # of aticles “for”, versus number of articles “against”. A bit like assessing student essays – toss them down the stairwell, and mark according to weight and distance covered. 1979 hey Green Davey? So that’s where it all began for you? Back when all the Cli-Sci was screaming Global Cooling? Your geography teacher must have been a dedicated disciple of the Club of Rome who have been pushing “end is nigh”, hot and cold, sandwich board scenarios since 1972. Did it ever occur to you to ask him that with the exponential increase in ACO2 since the maximum warmth of the low industrial activity depression era of the ’30s how come all that added ACO2 from a violent world war followed by 35 years of unprecedented industrial activity had, to that time, only caused cooling? Or were you maybe not paying attention? A bit rough keeping David in moderation Don, while allowing Drongo to personally bait him. Tell me again, about your love for free speech. A shame. I let this comment in to remind you, Ross, that there are rules. David and you are bound by them, There are rules even about free speech, as you should remember. Don, I read an interview the other day as to how passionate you were about free speech. David and I are ‘bound’ by your special rules, but not others. The next time you are interviewed, pause and think before answering just how passionate you actually are, Don. When put to the actual test on your own website, you chose censorship. But since you reserve this right, I still don’t think it’s very classy to publish letters that set out to bait and ridicule other contributors (that would be either David or myself) in the knowledge the we will have no right of reply. Everyone is bound by the no-more-than-three-comments-a-day rule, while you and David are bound also by the rule of one substantial contribution for each short snipe or criticism. And you do have the right of reply, but you don’t have the right of unlimited reply. And you have to wait until I open the website and look for what’s in moderation. Truth is, Ross, you don’t like rules that limit your freedom to say or do what you like. And you like being a free rider. I recall doing relief-teaching in both Phillip and Erindale Colleges in 1979 and the years surrounding – English and History being my provinces at just that time when the English curriculum was converting from a literature- to an issues-based discipline. One of those ‘Issues’ units was ‘War And Peace’ and one of the films I was directed to show on more than one occasion was about the effects of Thermo-nuclear war and its effect on climate – Nuclear winter in particular. The imagery was powerful stuff – humans in ragged furs on a bleak landscape, and these were certainly signatory images for the time, the anxiety being pitched at future freeze rather than warm. This was also toward the end of the era when books like ‘Blueprint For Survival’ and ‘Limits To Growth’ were predicting the planet would run out of oil by the 1990’s, and we would be lucky to escape a major Nuclear War by the end of the century. We didn’t, and we were. In my own senior education, a dozen years earlier, the biology component of Science had a newish addition called Ecology which taught, among other things, that Carbon dioxide (CO2) was a trace gas in the atmosphere but nonetheless essential plant ‘food’ in the photosynthesising process. I gather this is still true, whereas the warming and the accumulation of CO2 in the atmosphere has not strayed beyond regular fluctuation. Life moves on, and so does learning. Alan, around that time the astronomer, Carl Sagan had a TV series – Cosmos -and I believe it was his theory of the Nuclear Winter which featured in the final episode which lit the fire under that concept. I never understood it. The proposal was the dust from a nuclear war would fill the upper atmosphere for years and the ensuing cooling of he Earth would cause crops to fail worldwide. That may have been so. The eruption of Krakatoa had a similar effect, with the dust reportedly circling the northern hemisphere for seven years. The bit that escaped me was what force of nature would cause the dust to spill into the southern hemisphere. It was unlikely to cross the Equator for the same reason that ocean and wind currents do not. I was dismayed that Sagan wasn’t asked publicly to explain how this might occur. It was a bleak time. Demonstrators, buoyed by their results of the Vietnam anti war demos, became protestors. In the UK Greenham Common in particular and the Campaign for Nuclear Disarmament (CND) was revitalised with the deployment of US nuclear missiles. Acid rain and Dutch Elm Disease, both of which had been known of for many years, were highlighted in Germany by protesters who claimed the burning of brown coal in the Ruhr Valley was the cause of both. That triggered German interest in Nuclear energy. I seem to recall about this time we were all going to die from Toxic Shock Syndrome (caused by repeated contact with cotton products) or be poisoned by eating food kept in Tupperware containers. As for a lucky escape from nuclear war, it was always unlikely to happen. I know it was real for those of us who lived through the period, but it was a comfort to know that the hand on the button was stayed by MAD – mutually assured destruction. You and I might have been dismissed as collateral damage, but the threat of personal immolation was enough to keep the hotheads under control. You recall for me more of the counters of that era. I thought the wisdom on Nuclear War was that we would be lucky to escape one, unlucky to be wiped out by it, but this might have been abroad in the ’60’s more than ’79, with the popularity of Nevil Shute’s novel. I had forgotten the Carl Sagan, but do recall the way boys in boarding school dormitories used to enjoy terrifying themselves after lightsout with the “8-minute warning” which, by mid-decade had become the “3-minute warning”. I suspect we were, in fact, the safest boys on the planet in a long compendium of centuries. the sheer inefficiency of the CO2 molecule as a building block for a greenhouse fabric was one of the details that got me going on the AGW issue, both its power to retain heat and its minuscule percentage in the atmosphere. Yes, I remember AGW concerns early eighties. David, can you recall if your geography teacher mentioned CO2’s IR absorption line particularly its 15 micron absoption line. Did he mention 3 out of CO2’s 4 absorption lines are well outside of Earth’s radiation into space, and the only one inside Earth’s IR radiation is well outside the higher IR energy range and even outside the bulk of Earth’s radiation. Did he mention the 15 micron line is equivalent to a black body temperature of -80c (YES that is a minus)? Also did your geography teacher mentioned the wavelength range of IR (0.7 to 100 microns? Or, did he just show you the misleading picture of red lines (rays) emitting from Earth’s surface then bouncing around where about 1/2 of the lines end up heading back towards the surface and the other 1/2 or so head out to space. I am surprised you mentioned your geography teacher taught you about clouds as part of the mix. We still do not know how clouds cool or warm the planet today. You will have to excuse me if I do not recall the all details of a high school geography elective I took 37 years ago. We would not have covered the topic in that detail and I certainly would not have raised those sorts of questions. Its high school. I was 17. I would have been more interested in playing cards in my free period or taking Friday off to go surfing down the coast or this girl in my maths class. 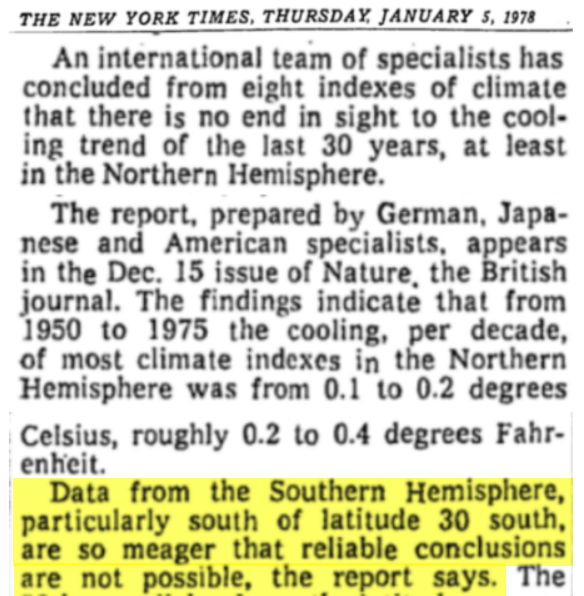 My point is that the AGW “concern” or “scare” pre-dates 1988. The transcript of my Year 12 Certificate states that in 1979 I took an elective called “Climatic Change” as part of a Major in Geography. The course content would have been approved by the ACT Schools Authority in consultation with ANU and Canberra CAE. In addition, I would expect the Vice Chancellors of Canberra’s Universities, especially ones claiming to be well read, to be aware of what has been taught about climate change in the local high schools since the late 1970’s. And to Ross, welcome back! For someone who is so concerned about statistics you can be sloppy in your use of words. ‘the AGW “concern” or “scare” pre-dates 1988.’ No, the ‘concern’ predates the ‘scare’ — unless you can find another event of real force prior to Hansen’s testimony in June 1988. ‘1. Humans are responsible for increasing levels of C02’ For all the increase? For some of it? If for some, a little bit, a big bit? In any of these cases, how do you know? Certainly no one at all had a real handle on these proportions in 1979. We still don’t. ‘2. CO2 causes increased temperature’ Hmm. Theoretically, it ought to, but as we saw during the ‘pause’, the effect can be overcome by other factors, which suggests that the effect is not decisive. Yes, over the very long run, an increase in CO2 ought to mean an increase in temperature, but everything suggests that the effect is logarithmic as well, meaning a long process. ‘3. Without intervention AGW has the potential to be problematic’ I can well imagine your teacher not knowing what the consequences might be, since nearly forty years later there is great debate about it all. But what intervention? Surely the teacher wasn’t pointing to abandoning fossil fuels for renewable energy. What problems, exactly? The problems all come from GCMs and their modelling, and they weren’t about in 1979. What we know is that warming is generally better than cooling. And so on. None of what you have said looks at all ‘spot on’. In 1979 I was teaching at Macquarie university in Sydney, and although I chaired a review of the ACT schools legislation at the end of the century, our task did not involve curriculum matters. Don you are floundering. You don’t accept the gravity of AGW, hence points 1, 2, & 3. We all sort of get that. Concern or scare [your words] for AGW existed pre 1988 eg Geography at Philip College 1979. Thanks, Don. A book would help to get the rational message out. Many have been written and they are responsible for much of the scepticism of the Club of Rome type paranoia that is slowly being overcome. First rate! Your summary is encompassing, lucid, and fair as always. Peter E. is right, the publication of this in a widely distributed daily would enhance the availability of The Sceptic challenge at its most searching. I bring only one extra aspect to this, which is an interest (and horror) of the pathos of the warming scare, seeing it as a propensity within societies to be infected by an anxiety that is in fact a panic while not disclosing itself by the overt symptoms of panic. An area of study for the future (not requiring those trillions) would be to study the behavioural mechanisms that drove things like the witch-hunts, dancing manias, ‘red-scare’ excesses of former times, and the sheer reflexive rages that CAGW rouses when a challenge to it raises a head. Thanks Don. A very useful summary and a reminder that this un-scientific scare has been going on for some 30 years. As Mike says, the many backs being scratched would surely have contributed to the longevity of claims constantly at odds with the facts. With so much to know, few are experts, but I have found two books in particular that put the main shapers of climate in perspective for me: Bob Carter’s ‘Taxing Air’ and the Howard Brady’s more recent ‘Mirrors and Mazes’. Both books present atmospherics as just one consideration along with solar variations, ocean heat transfers and other things beyond our control. For me, this reinforced the fact that ‘Climate Sensitivity’ calculations based mainly on CO2 levels were doomed to fail, as they have, and there is much more to this chaotic, non-linear system than those aiming for climate control by cutting CO2 emissions understand. To this I would add, there is also much more to cutting CO2 than, as Don says, trying to replace conventional power sources with large scale wind and solar as South Australia is finding to their cost – all of which was completely predictable, as we all know, but with so many vested interests cheering the politicians on, the facts got lost in the noise. Hopefully, this is no longer so and as Peter K discusses, things may be on the turn now some of the passion has gone out of what passes for climate debate. Hello Don I am keen to email the link for your 16 essays but the brown icon on the home page only lists 1 to 8. Can you help please? All done. Sorry for the delay. It was more complicated than I thought. What does this actually mean, if anything? It’s not a mathematical or scientific use of the term “average”. This is how climate was described before all the scare began – https://en.wikipedia.org/wiki/K%C3%B6ppen_climate_classification or the BOM site version for Australia – http://www.bom.gov.au/iwk/climate_zones/. Is the contemporary newfangled method some sort of averaging of all the component averages – temperature, wind speed, wind direction over neighboring terrain, barometric pressure, soil absorption, almost forgot rainfall. Climate, sometimes understood as the “average weather,” is defined as the measurement of the mean and variability of relevant quantities of certain variables (such as temperature, precipitation or wind) over a period of time, ranging from months to thousands or millions of years. You can see that the WMO doesn’t say why 30 years is the classical period, and it hedges its bets a bit in the first para. The position of South Australia is interesting. So is Tasmania. We hold ourselves up to be ” clean and green”. Yet we import power produced from burning coal in Victoria. Worse, following the cable breakdown, the subsequent depletion of our water storages, and the temporary installation of diesel driven generators, we are are to investigate a second cable. It seems to me that if Tasmania cannot be self sufficient and 100% renewable, it won’t happen anywhere. Your readers might be interested in the latest edition of Media Watch, concerning The Australians coverage of coral bleaching on the Great Barrier Reef. Interesting. And I think relevant to how Climate Change is covered and discussed (or not). Ross tell us how to mitigate your so called CAGW. Here’s the pie chart AGAIN showing that S&W make up SFA of TOTAL global energy. Tell us how you would reduce global temps and by how much. Of course you should also understand that Obama’s latest EIA report forecasts Co2 emissions will actually increase by 34% by 2040. Ross, you mean a story from a biased ABC presenter through an even more biased medium? Yes, that was an interesting link to Andrew Bolt and his opinions about the ABC, and bias, but no, I mean Media Watch and the way the Australian has covered the coral bleaching of the Great Barrier Reef. And that applies perfectly to many of those GBR “scientists”. Where were you? You seem to be MIA throughout that post. Have you read JIm Steele’s paper and the support it gives Peter Ridd ? As opposed to the bed wetting clap-trap that issues from the likes of Ove HG that the ABC loves to quote. I posted Jim Steele’s paper back then and you were free to read it in greater detail than the ABC obviously did in their one eyed article. It links to a lot of extra detail as well. ….The Australians (non) coverage of international warnings on coral bleaching. And when it did, the amount of space it gave to some teacher in America with a background in ‘birds’, arguing on some blog site, against all the accepted science from people who actually study the bloody stuff. The Australian didn’t feel it important to mention our blog friends utter lack of any expertise in the field. But that’s the fun of anti climate change blog sites…. isn’t it? What utter hubris when Steele’s paper points out that coral bleaching is a natural selection process and a necessary part of its evolution. Neither you nor Media Watch read Steele with all its links yet you both feel you can drive over the messenger with a truck. If you both had taken the trouble to read it you might understand that the Australian article was based on facts and figures, not the hysteria produced by ABC and OHG. And you wonder why rational people are sceptical of your religion? Thanks for this very good and fair summary Don. Here is Ken Stewart’s June pause update for the UAH V 6 lower trop. Plenty of graphs to look at here for the world’s regions etc. And the South polar region has cooled slightly since Dec 1978. OZ has shown the fastest cooling trend since 1998, see last graph. Remember the lower trop is the area that should be warming faster than the surface according to AGW theory. Bjorn Lomborg’s latest WSJ update looks at the cost of reducing their CAGW by an optimistic 0.17C by 2100. Last years COP 21 will cost 100 trillion dollars if these donkeys get their way and perhaps achieve a reduction in temp that can’t be measured. The stupidity of the pollies is beyond belief, yet we have weak- minded fools who believe in this garbage. Little wonder that even Hansen won’t buy it. Here’s Lomborg’s quote and the link. In a recent US Congress hearing, EPA administrator Gina McCarthy refused to be drawn on how much the Paris climate treaty would cut global temperatures. “As Bjorn Lomborg explains in Wall Street Journal, that’s not surprising, because the answer would be embarrassing: even under an optimistic scenario, global temperatures in 2100 would drop by 0.3°F (0.17°C), whereas the cost of the Paris treaty adds up to $100 trillion. He sets out the case for a much more efficient approach, costing just a fraction of today’s misguided climate policies. Every day, policy-makers face a dizzying array of choices. But they rarely compare options explicitly to figure out where first to direct additional money. The Copenhagen Consensus Center’s approach has long been used to look at global and regional problems. Now it has been applied for the first time at a national level. In Bangladesh, specialist economists studied 76 proposals to brighten the country’s future, and an eminent panel prioritized them. Read Bjorn Lomborg’s column for Project Syndicate in five languages. It was published by newspapers around the world, including The Australian, Shanghai Daily, Arab News, Myanmar Times, El Tiempo (Colombia) and La Nacion (Costa Rica). Some people talk about climate change in apocalyptic terms, while others deny its existence. In a radio interview with the Canadian Broadcasting Corporation, Bjorn Lomborg points out that climate change is a real problem, but not the end of the world. Right now, we even see benefits of global warming such as fewer cold deaths and global greening. Lomborg also wrote a column on this topic for Colombian magazine Semana Sostenible. It looks like Germany, Britain etc are waking up to the renewable energy fra-d. Yet here in OZ we are still building more of these monstrous bird mincers and clueless solar energy. But when will these pollies concede that the mitigation of their so called CAGW is nothing more than a corrupt fairy tale? Don estimates that the planet has warmed by about 1 C in the last 150 years, or since 1866. The IPCC prefers the HAD 4 data-base and this is the longest dbase starting in 1850 or 166 years ago. The Wood for trees software is updated monthly and if the trend is checked since 1850 it shows just 0.8 C increase in temp. Here is the link. Yet the maths experts at Concordia Uni claimed there has been 0.7 C warming since 1800 and OZ had contributed just 0.006 C of the planet’s AGW in the last 2016 years. That’s just six thousandths of 1 C since 1800. But we have to ask how much of our 0.006 C is due to AGW and how much is just a natural increase as the planet has recovered from one of the coldest sustained periods ( LIA) of the Holocene. Of course the Lloyd study found that the average temp deviation per century over the last 8,000 years was about 1 C. He used ice core measurements from both Greenland and Antarctica to gain a more accurate account for his study. So where is the impact from our increase in Co2 emissions? Sorry 9th line above should be last 216 years not 2016. Too much on my tiny brain this morning. BTW here is the link to the Lloyd study. Welcome to South Australia, the state of the art WRT the solutions for “Climate Change”. Where Australian taxpayers subsidise industry with multi-billions to be driven by “renewable” power costing us more billions yet that huge outlay will not only not prevent any emissions but will generate more ACO2 than ever before at exponentially higher prices than ever before. Yet our “academics” reject a system that would audit this horrendous waste of our hard-won cash and resources. Kip Hansen has done an interesting article on the food nannies telling us of the evils of Big Sugar, much like the evils of Big Carbon, Big Barrier Reef, Big Salt, Big Fat, Big Carbos etc. The temperature in Brisbane today reached 29.1c to equal the record set in 1946. Channel 9 was wrongly screaming an all-time record but it’s interesting that highest astronomical tides in Brisbane in 1946 were actually higher than they are now so there must have been a little warming happening 70 years ago too.